The DCMA’s latest event took place at Ushaw College, Durham on Saturday 9 March 2019. The music workshop addressed the needs of parishes that do not have a keyboard player or organist available to help support the music at Mass. The workshop was led by Evanna Donachie, guitarist and music group member at St. Joseph’s Church, Durham and Alison Purvis, choir leader at St. Cuthbert’s Church, Durham and chair of the DCMA. 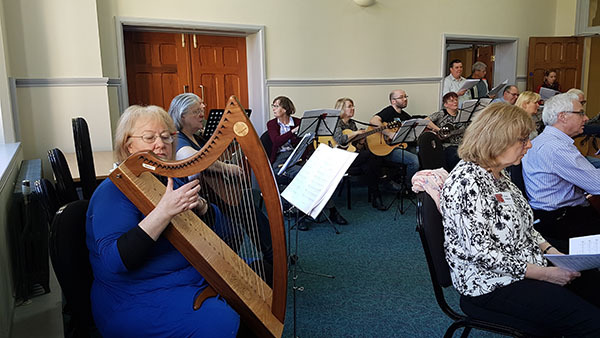 They presented a selection of gathering songs, Mass parts, Psalms and Communion songs, chosen to give participants a flavour of some of the music available for guitarists and melody instrument players. They also recommended a number of online resources where music could be viewed, heard and downloaded for parish use. The DCMA welcomed a veritable medley of musical instruments; guitars, ukuleles, recorders, an alto sax, an acoustic bass and even a Gaelic harp (a first for the DCMA!). Participants enjoyed the variety of music that was presented as well as the opportunity to sing and play with other musicians, all in the splendid setting of Ushaw College. One group from Blackhall said they were "exhausted but uplifted" and were sure to use some of the workshop resources in their own parish. The day ended with a closing liturgy in St. Joseph’s Chapel, using music learned throughout the day. If you missed the workshop but would like any help with the music for your parish liturgy, don’t hesitate to get in touch with Alison by email. On Wednesday 3 October, Kate Swaddle, treasurer of the Diocesan Church Music Association organised a workshop tour of Harrison & Harrison Ltd., who are prestigious, world-renowned organ builders, situated in Meadowfield, Durham, in the heart of our Diocese. Read the article here and view a collection of images from the event. The Diocesan Church Music Association held a Mass settings workshop at St. Hilda’s Diocesan Resource Centre, Newcastle on Wednesday 25 April 2018. Paul Berry from St. Mary's, Hexham directed a workshop on music for the Triduum liturgies at Easter. A very enjoyable Composers’ Forum was held on 23rd January 2016 when parish musicians from across the Diocese came to meet each other and share their music.